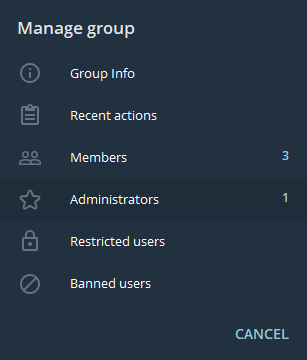 To start using fovbot you need to add it to the chat and give to bot full administrator rights. By clicking on the chat name at the top of the screen, you&apos;ll see information about chat. Next, we assign a chat to the "supergroup". Go to "Administrators" and add fovbot. 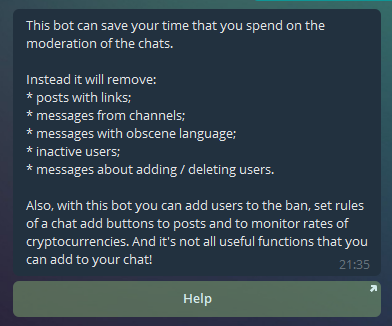 Now you can select a chat from the bot in the "my chats" tab and start using the bot. 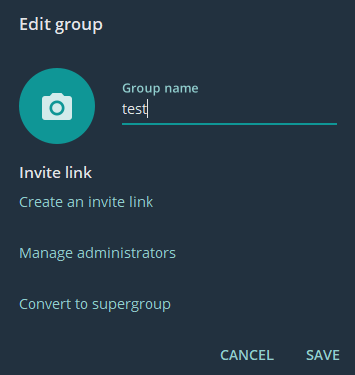 You can add a bot to several chats. When you click on the "Support" button, you can contact the support service. On the "Donate" you will see a QR code and Bitcoin wallet for which you can donate money for support developers of the project. You can go to bot news group by clicking on "Communication". You will be able to go to the page with help.